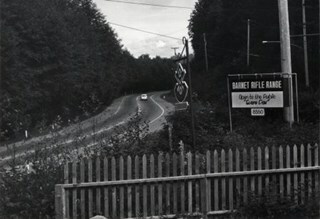 Photograph shows the sign at the entrance to the Barnet Rifle Club and the Rifle Range at 8550 Barnet Road. Photograph shows a man ascending the steps of the Barnet Rifle Club Clubhouse. Photograph shows the covered firing line at the Barnet Rifle Range. Photograph shows two men shooting at targets on the Barnet Rifle Range. This portion of the interview is about John Kirbyson’s description of the use of local knowledge and the history of the mountain in developing the 1999 Burnaby Mountain Conservation Area Management Plan. He talks about particular stakeholders such as streamkeeper, naturalists, hikers and biker groups; the decision to exclude the target range from the conservation area; and his family’s activities on the mountain. This portion of the interview is about Ron Burton telling about the creation of the Mountain Air Bike Park and the importance of skill building for bike riders. He also talks about the shift from using the site as a target range and how sports affect our view of who we are in the world. Recording is of an interview with Ron Burton conducted by Kathy Bossort. Ron Burton was one of 23 participants interviewed as part of the Community Heritage Commission’s Burnaby Mountain Oral History Project. 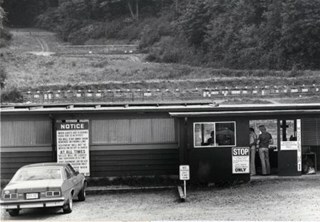 The interview is mainly about the founding, goals, and activities of the Burnaby Mountain Biking Association as told by one of the founders and President of the club, Ron Burton, and about the development of mountain biking and trail construction on Burnaby Mountain, both prior to and after the creation of the conservation area in 1995/96. Ron Burton also talks about his childhood, his work as a Burnaby school trustee, and the sports and recreational activities he has enjoyed on the mountain. Ron Burton was born in Burnaby in 1954 to Fred and Shirley Burton. He grew up in East Vancouver and attended Hastings Elementary and Gladstone Secondary schools. He worked on the waterfront for Viterra, became a member of the Grain Workers Union and joined the NDP in 1972. He and his wife moved to Burnaby’s Vancouver Heights in 1982 and Forest Grove in 1988. He has served as a Board of Education Trustee in the Burnaby School District since first being elected in 1987, currently serving as Board Chair. Ron is founder and President of the Burnaby Mountain Biking Association and an active rider on Burnaby Mountain since 1988. The Association was founded in 2000, registering as a society in 2005, with the goals to build sustainable trails on Burnaby Mountain, to provide education about trail riding, and to advocate for and improve the image of mountain biking. Under Ron’s leadership the Association has successfully recruited members and formed a cooperative relationship with Burnaby’s Parks staff and with other park trail users. 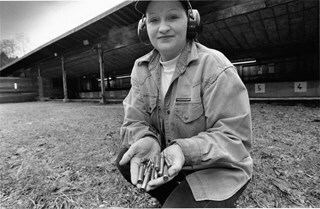 Photograph of Val Legault, range officer at the Barnet Rifle Club holding a handful of cartridges. Note in black and blue ink on recto of photograph reads: "Bby Bartel 121 / 94% Bby p. 9"